Rockefeller Capital ManagementRockefeller Capital Management’s Greg Fleming. Greg Fleming, a former Morgan Stanley executive, is turning the former Rockefeller family office into a financial services firm. He aims to increase the firm’s assets under management from $US18.6 billion to $US100 billion. The firm tacked on an investment firm focused on the ultra-wealthy in its first – but not its last – acquisition. Greg Fleming hasn’t been shy about his ambitions to turn what was the Rockefeller family office into a behemoth of a financial services firm. 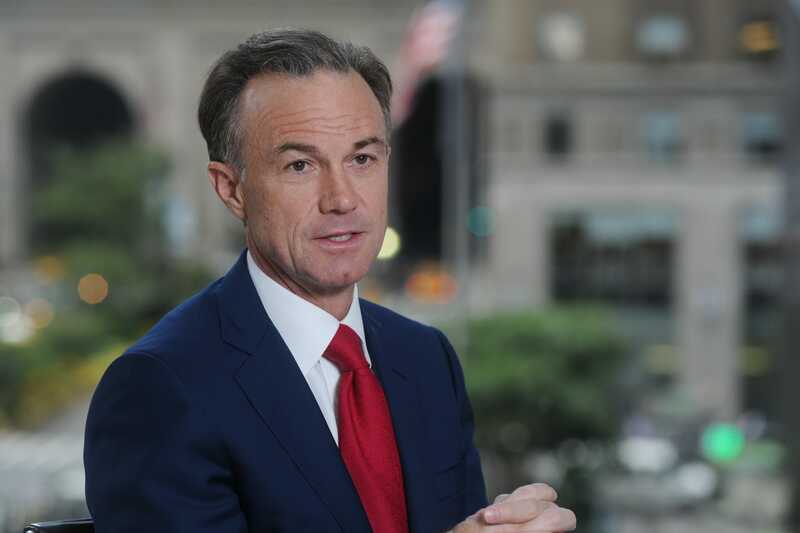 The former Morgan Stanley and Merrill Lynch executive, who joined New York-based Rockefeller Capital Management last year, oversees $US18.6 billion now, but is aiming for assets to top $US100 billion by 2023.Rockefeller – which focuses on wealth management, investing and M&A advisory for wealthy clients – has backing from Viking Global, one of the world’s largest hedge funds. Part of Rockefeller’s growth will come through acquisitions, the first of which the company made Thursday with the addition of Greer Anderson Capital, a private investment management firm that was founded in 2008 to focus on ultra-high-net-worth and high-net-worth individuals. The Greenwich, Connecticut-based firm is led by Philip Greer and Gary Anderson, who are joining Rockefeller’s global family office arm. Greer Anderson oversees about $US200 million in assets, according to a July filing with the Securities and Exchange Commission. Greer Anderson, Fleming said in an interview with Business Insider, will not be the last buy as the company looks to boost its assets. Greer previously founded Weiss Peck & Greer, an asset manager that oversaw $US20 billion and was sold in 1998. Anderson, his son-in-law, served as chief investment officer at the firm and, before that, worked as investments director for Tulane University’s endowment. Terms of the deal with Rockefeller were not disclosed. As for Rockefeller, expansion has also included team build-outs. Last week, the firm poached a senior investment banker from Bank of America Merrill Lynch. And earlier this year, Mark Patterson – an investment banker at Merrill Lynch until 2009 – joined Rockefeller as a senior adviser. Technology executive Christopher Randazzo left Morgan Stanley in March to join as head of wealth management and head of technology and operations. Rockefeller Capital’s chief financial officer, Ed Moriarty, and chief operating officer, Harry Singh, were each lured away from senior positions at Morgan Stanley as well.